Was on campus for an unofficial yesterday. Elite PG prospect with Donny Daniels fingerprint on it early. Lot of blatant carrying the ball on his dribble. Of course, most refs let that go now. Coaches Take: If there is such a thing as a Class of 2020 PG, being productive, efficient, unselfish, exciting, against the elite competition in California, Dominick Harris qualifies as trailblazer for the new generation of guards to hit the basketball scene. Dominick is a athletic and explosive guard with a lethal first step and crossover ability, exceptional handles that allows him to get into the lane effortlessly. He is a solid passer who always looks for the open man….He is a premier on the ball defender with extraordinary lateral quickness that frustrates his opponents, his huge wingspan allows him to play bigger than his size of 6’3". Dominick has an exceptional mid-rang game, and he is equally as deadly behind the arc, he finishes masterfully above the rim and is an exceptional scorer at 25ppg. He is extremely coachable with a great attitude and loves to practice and develop his game, prototypical gym rat. Interest, unofficial visits: USC, UCLA, Kansas, University of Maryland, University of Texas, Utah, Florida State, Gonzaga, San Diego State, UNLV, Texas Tech, Stanford, UCSB, Tulane, Pepperdine, UCONN, LMU, Illinois. Thus far. I love his game. Stay on him Donny. I see a hat ceremony with Zags, Duke, & Wiscy. We don't have to sweat it though because when he walks into the room he's wearing a G Unit tee. Think Big. No think Bigger than that! Newport Beach? C'mon guys, be realistic. lol. I agree with you. Riiiight. SDSU campus ain't Newport. Pick is Bruins or Trojans. Daniels should save the airfare. On this Sunday morning all I can say is "Oh ye of little faith!" Hideously ugly Lonzo Ball jumper, but oddly enough, similar success rate. If he keeps improving, there will be pressure to attend Mater Dei. Yeah this seems like the trend every year. We send DD out to waste time and resources chasing guys who arent leaving SoCal or the Southwest. Wasn't one of the reasons we hired Daniels for his California recruiting connections -- seems like we complain when we don't get looks from those recruits and we complain when we do. Would rather having him "wasting time" on good players -- especially since he is getting them to come to Spokane to take a look at the program-- never know what will happen when we get them here. Abs true but gotta admit his "yield" w/HSers has been paltry. Higher hit rate with transfers and 5th years. Recruiting has changed so much last 5-10 years, I suspect DD's approach with HSers is anachronistic. He got the kid to visit us in Spokane -- that is half the battle. Maybe he is a kid who doesn't like the overpriced everything and traffic/crowds/earthquakes associated with Cali-- Spokane might be a good fit --but he needs to be here to see it. I'm willing to give Daniels credit for getting a good recruit to consider us and come to Spokane for a look. Exactly, on his release his left hand is almost on the top of the ball instead of the side. 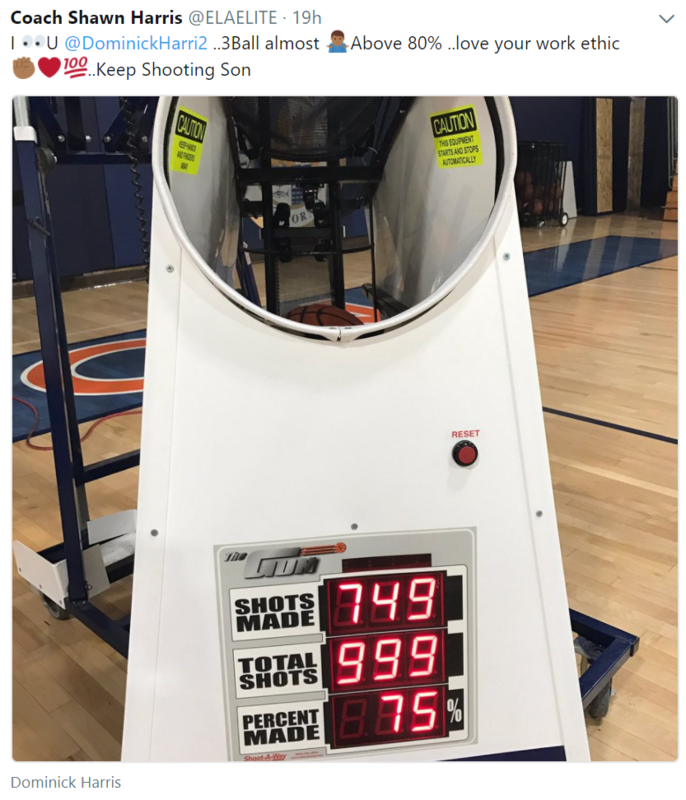 We were always told by that at his age if you make a major change to your shot, especially if you are already a good shooter with quick release, it will often end up making you a worse shooter (but that was mid to late 70's, lol). Also, as Maynard mentioned if the refs don't call the high dribble, at the college level D1 he could be a good target to get picked. 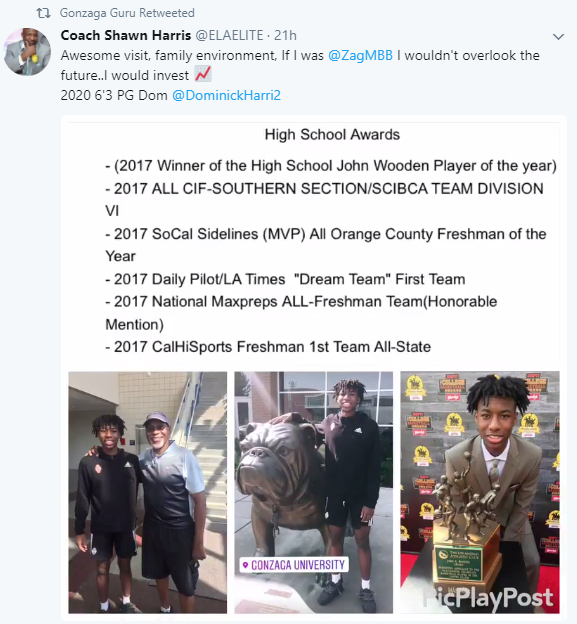 Now, not a criticism of him as I know nothing of how good this kid could get and my observations as well as some others mentioned already are just observations- how good he could be at the next level, well, that's up to college scouts and coaches to decide, not me.... Just watching that clip I was drooling over him as a Zag and the possibilities! "Blake Stepp had a reputation for saying little. That's probably because he had to clench his teeth and wince so much, playing through the pain." So much for my "observations" , lol... His stats as well as Donny being on him answer any questions I might have had!! !